At Eurobike 2016 Crank Brothers presented a new line of portable hand pumps. Some months ago we got ahold of the Klic high volume, made specifically for mountain bikes. One key characteristic of this pump is the hidden, magnetic rubber hose with a built in pressure gauge. It can also be used for measuring the pressure independently, since it can be attached to the valve losing only the small amount of air that’s required for the measurement. To ease the pumping, a folding and locking handle, positioned perpendicularly to the pump, is available. Last but not least, unscrewing one end of the Klic, you have the CO2 adaptor. I used the CB Klic quite a lot, especially on holidays, since I did not carry a proper pump, relying on the performance of the portable pump and its pressure gauge. Furthermore, being a high volume pump and given its rather large dimensions, it is also easy to use when you need to inflate a lot. 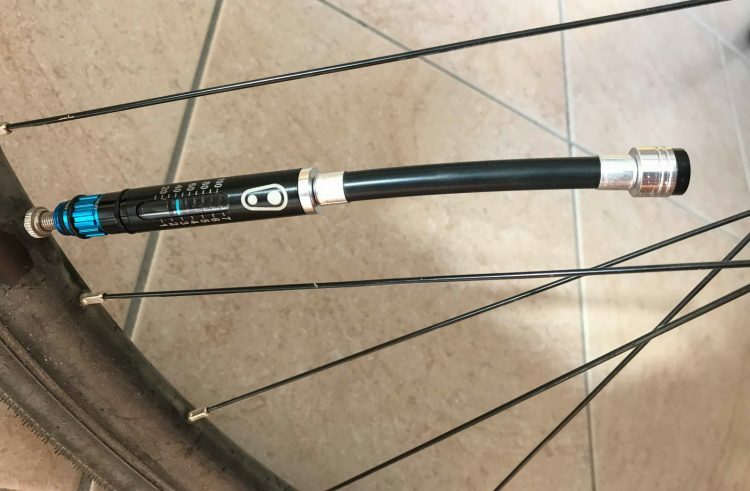 One of the most appreciated details is the hose with pressure gauge: turn and remove the handle, and with just a slight touch, the hose pops out and is ready to be attached to Presta or Schräder valves (you just need to unscrew and rotate the blue part). On the pump side, the magnetic system worked perfectly: the hose always stayed still despite the extreme angles at which I inflated on trail. The pressure is indicated on a Bar and PSI scale. Given the dimensions, there are only 5 PSI levels, from 1 to 5, so it is not as precise as a digital pump, but it is surely enough to inflate at the desired pressure. Most of all, there’s little chance of underinflating a tire right after a puncture, so you have less risk of another flat. As already said, with the gauge you can also just check the pressure, which is pretty useful on long trails with a lot of vertical meters and temperature changes, where you get harder tires at the top of the climb. 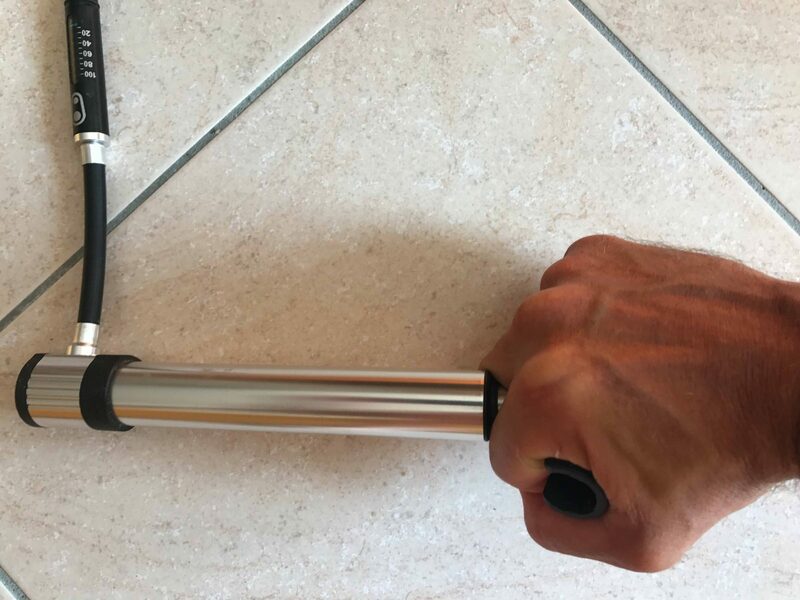 The Klic is not meant to be on the ground while pumping, but you can inflate a MTB tire quite fast and effortlessly thanks to its dimensions and its handle. The only issue we had is that when the piston is at the end of the travel, you tend to touch the pump with the fingers, especially if you have big hands. It would be nice to have half a centimeter more (at the end of the travel, the piston is 2cm from the body of the pump). 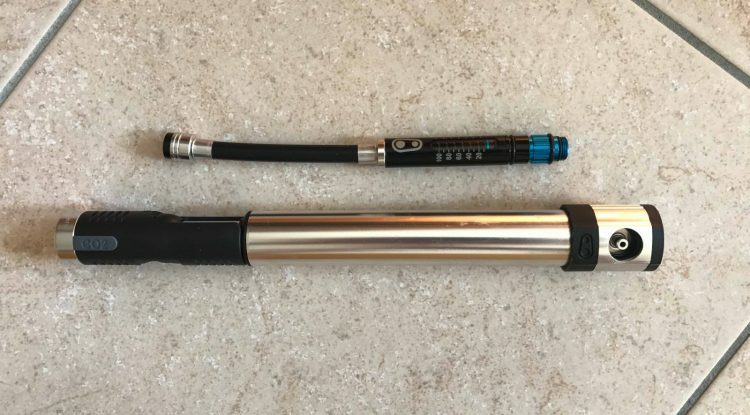 We didn’t use the CO2 adaptor, but it works like all similar minimalist tools out there: you screw it to the cartridge at one end and insert it into the valve at the other end. 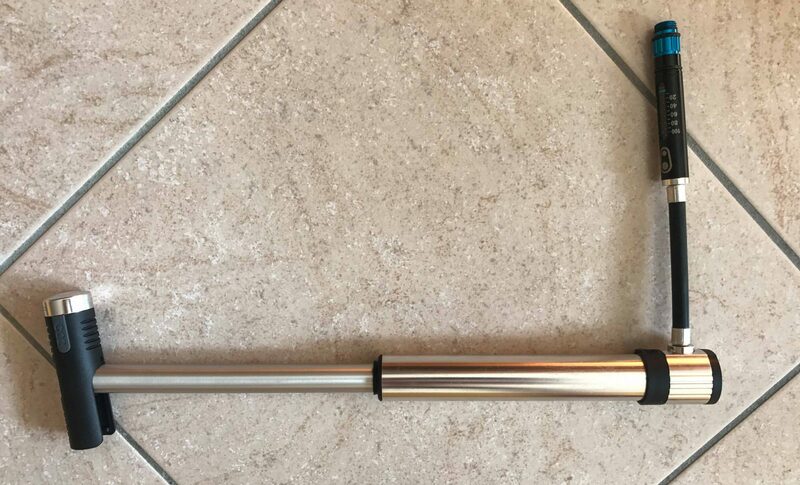 The Crank Brothers Klic is solid: despite its overall length, with the piston fully extended, it almost doesn’t bend and consequently it works smoothly even in those intricate positions you have to inflate after a flat on a trail. We didn’t count the number of strokes needed to inflate at 2 bar since it doesn’t make sense considering all the various tires’ dimensions on the market. To those who usually don’t carry a back pack: I carried the Klic in our jersey pocket. Anyway it is shipped with a frame mount to be installed under the water bottle cage should you choose to go that route. The Crank Brothers Klic HV + CO2 is a well thought out pump, very efficient on trail. One useful feature is the pressure gauge, which can be installed magnetically in one second. With its dimensions, it is easy to inflate a MTB tire, largely thanks to the folding handle.